The New Globe Theatre Interior is as authentic as possible. Features of the new Globe Theatre are the two huge ' Herculean ' pillars. The ' Herculean ' pillars of the original Globe Theatre were made of huge, single tree trunks which were drilled through the centre to eliminate warping of the wood. They were then painted to give a marble appearance emulating the Roman and Greek classic styles. 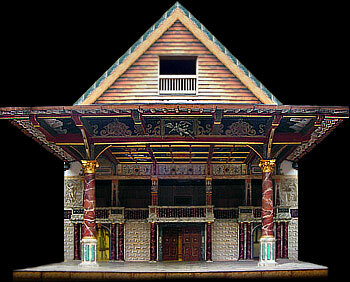 The pillars in the New Globe theatre interior have been emulated to create the same effect. The pillars support a stage roof called the 'Heavens '. The Heavens are painted with pictures of the sun, moon and the zodiac. Behind the pillars is the stage wall called the ' Frons Scenae ' (taken from the name given by Imperial Rome to the stage walls of their amphitheatres). A doorway to the left and right and a curtained central doorway from which the actors make their entrances. Above the door area is a highly decorative screen. The statues on the right and left of the stage represent the themes of Comedy and Tragedy. Interesting Facts and information about the New Globe Theatre Interior. Additional details, facts and information about the Globe Theatre can be accessed via the Globe Theatre Sitemap.